The Stand Steady Winston Workstation Triple Monitor Mount Sit-Stand Desk Converter is a sleek, modern, and minimalist way to stand while you work. If you want a standing desk converter that takes up very little space while providing perfect monitor placement, this is the one for you! KEEP YOUR EXISTING DESK: Convert any desk or tabletop surface to a healthy stand up desk workstation in minutes with this monitor arm and keyboard tray. 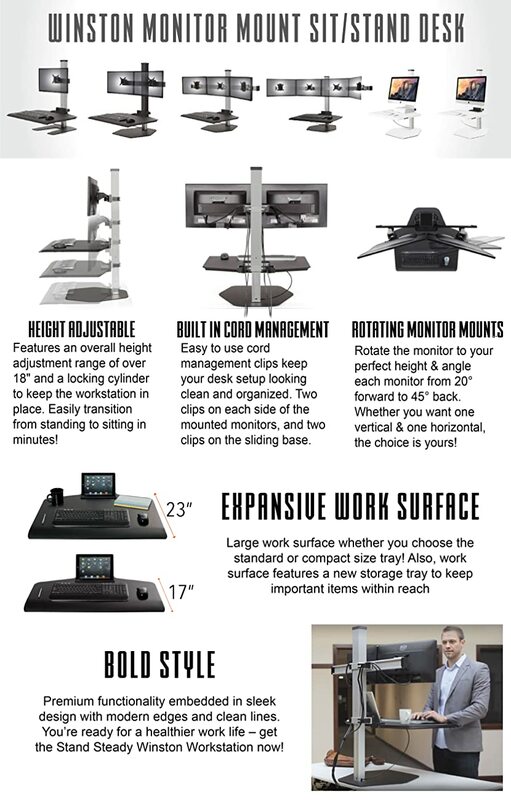 Simply set the Winston Workstation on top and start standing – so easy! VESA COMPATIBLE: Place your computer screens not only at the perfect height, but also distance and tilt. You can rotate them to portrait position as well! EXPANSIVE WORK SPACE: Oversized 30" x 23" desktop surface allows you to bring all necessities with you when you stand or sit! TABLET & PHONE TRAY: Props up your mobile devices for easy viewing. SEAMLESS HEIGHT ADJUSTMENT: Features an pneumatic height adjustment range of over 17" and a locking cylinder to keep the workstation in place. CABLE MANAGEMENT: Innovative clips along the column and beam keep cords organized and out of the way. BOLD STYLE: Premium functionality embedded in sleek design with modern edges and clean lines. ASSEMBLED IN USA: Assembled with pride in the USA using a green manufacturing process and almost entirely recyclable materials. Turns any desk into a standing desk! Perfect for my office! It easily raises and lowers from sitting to standing height. Solid and stable for typing.